Bad Company is an English rock supergroup founded in 1973, consisting of two former Free band members—singer Paul Rodgers and drummer Simon Kirke—as well as Mott the Hoople guitarist Mick Ralphs and King Crimson bassist Boz Burrell. Peter Grant, who, in years prior, was a key component of fellow British rock band Led Zeppelin’s rise to fame, managed the band. 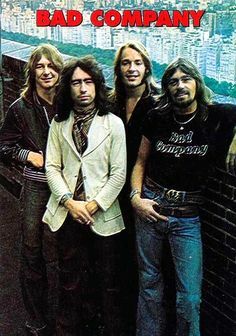 Bad Company enjoyed great success throughout the 1970s. Many of their singles, such as “Bad Company“, “Can’t Get Enough“, “Good Lovin’ Gone Bad“, and “Feel Like Makin’ Love“, retain popularity with rockers of both the past and present decades. To this day, their songs remain staples of classic rock radio. See for more.